The SOFC is a very-high-temperature fuel cell. Its electrolyte is usually made from zirconium oxide, ZrO2, zirconia. When traces of other oxides such as yttrium, calcium or magnesium oxide are added to the zirconia, it becomes capable of conducting oxygen ions. However this conductivity only becomes significant at very high temperatures and so the cell must operate at around 1000°C. Solid oxide electrolytes were first studied during the 1930s, with little success. However work continued during the 1950s and the 1960s. The most persistent programme was carried out by the US company Westinghouse (now owned by Siemens) in conjunction with the US Department of Energy. This finally established the SOFC as a viable proposition. As will all the other fuel cells discussed here, the cell reaction in the SOFC involves hydrogen and oxygen producing water. The difference between the SOFC and the low-temperature cells discussed earlier with acidic electrolytes is that while those provided hydrogen ion conduction, the SOFC electrolyte conducts oxygen ions. Oxygen delivered to the cathode of the cell reacts to produce oxygen ions which migrate through the electrolyte to the anode and react with hydrogen to produce water. At the elevated operating temperature this water is produced as vapour which is swept away in the fuel gas stream. The electrolyte used in the SOFC may be as thin as 10 microns. Electrodes must be bonded to this and these also serve as a support structure to give the cell strength. Since the cell operating temperature is so high, the different materials used in cell construction must be carefully designed to have the same coefficient of expansion otherwise the cell would crack apart as it was heated. The high temperature means that no catalyst is necessary to generate hydrogen and oxygen atoms at the electrodes. The anode is normally made from nickel dispersed in a ceramic matrix and the cathode from a conductive oxide that will not react with oxygen. The high temperature also allows the reformation of natural gas into hydrogen to take place directly on the nickel cathode. One of the key problems with a high-temperature SOFC fuel cell is to devise a means of keeping the hydrogen and oxygen separated. The solution to this devised by Westinghouse was to build the cell as a ceramic tube with the cathode inside and the anode outside. Other designs have employed planar cells but this necessitates more complex gas routing. The SOFC has a practical efficiency of around 50%. Its theoretical efficiency is somewhat higher though lower than that of the MCFC because of its higher temperature of operation. The simplicity of the SOFC design and its complete absence of liquids means that the SOFC fuel cell should have an extremely long operating life. Units have been tested for 60,000 h without failure and operating lives of 20 years or more can be expected. The robust nature of the SOFC makes a hybrid design attractive too. The SOFC cell can be operated at elevated pressure, with the high-temperature exhaust gas being fed into a gas turbine to generate additional electricity. 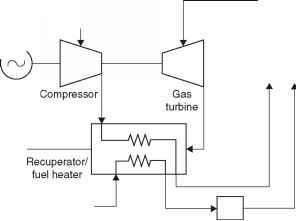 Even more power could then be derived from the system by using the waste heat from the gas turbine to generate steam in a waste-heat boiler for driving a steam turbine. Such an arrangement should be able to achieve 70% fuel to electricity conversion efficiency, possibly higher. 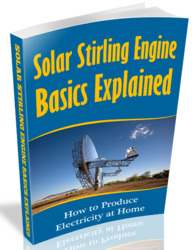 A large number of companies are now developing SOFC systems for power generation applications. Siemens (formerly Westinghouse) has tested a 100-kW unit and is developing both a 250-kW unit operating at atmospheric pressure and a 500-kW pressurised unit. Rolls Royce in the UK, Ceramic Fuel Cells in Australia and a variety of Japanese companies are also developing SOFC technology. SOFC technology can also lend itself to co-generation. This has been exploited by the Swiss company Sulzer which has developed a small SOFC-based co-generation system aimed at the domestic market. The company has been testing a 1-kW unit which can also provide a household with 2.5 KW of heat. 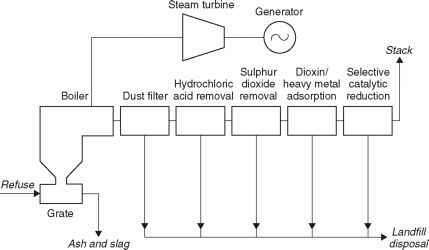 Figure 7.4 Block diagram of a SOFC/gas turbine power plant simple mass production techniques which should eventually yield economies of scale. It is unlikely that commercial SOFC power plants7 will be available at a competitive price before the second decade of the twenty-first century. Even so this is already viewed as the most promising of all fuel cell technologies.